Depending on which side of the divide you're on with Microsoft services, your next Android device could be shipping with either more useful apps or more bloatware. Microsoft announced that it has signed a deal with 11 Android OEMs, including Samsung, to bring Microsoft services to tablets and devices running Google's Android operating system. 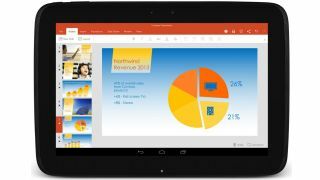 Under the terms of the deal, apps such as Word, Excel, PowerPoint, Outlook, OneNote, OneDrive, and Skype will come pre-loaded on Android devices. In addition to the Samsung partnership announced at MWC 2015, Microsoft announced that it has reached agreements with Dell, TrekStor, JP Sa Couto, Datamatic, DEXP, Hipstreet, QMobile, Tecno, Casper, and Pegatron. "For OEMs, these deals will increase the value of and enrich people's experiences on Android devices," Microsoft EVP of business development Peggy Johnson said in a statement. "And for Microsoft, this is part of the company's mobile-first, cloud-first vision. It is addressing consumer demand for top services by making them already available on a device, instead of requiring consumers to download them separately." This means that Microsoft's apps and services will ship alongside Google's apps and services such as Gmail, Google Drive, Google Docs, Google Sheets, and Google Slides out of the box. Although Microsoft competes with Android in the mobile space with its Windows Phone platform, soon to be renamed as Windows 10 for phones, the company has historically enjoyed a profitable relationship with Android manufacturers. Microsoft has licensing agreements with top Android OEMs for patents that Android infringes on. Most recently, the company was engaged in a lawsuit with Samsung over unpaid royalties on licensing, and it's unclear if the latest deal with Samsung to pre-load Microsoft apps on its Android devices, including the Galaxy S6 and Galaxy S6 Edge flagships, is a direct result of that lawsuit. Microsoft is also partnering with Xiaomi to create a custom ROM for that company's Android devices to run Windows Phone instead of Android.